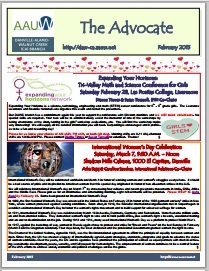 Download our February 2015 Advocate now: To read and print out our newsletter, click the image. Please be patient, the file size is fairly large. – Voting for our Branch Members to win the 2015 AAUW Art Contest between Feb 5-25. – Joining our International Women’s Day Celebration on March 7. – Making your reservation by March 1 to tour the Women’s Federal Prison on March 17. – Searching for gardens and volunteers for our May Garden Tour. Also, NOT detailed in our February 2015 Advocate, please join us for our Member’s Creativity Night on February 25. Submission deadline for the March 2015 issue of The Advocate is February 15. Please provide all website, newsletter or calendar submission through our submittal webpage.